Want a fun way for your child to learn to read? Horizons homeschool reading and phonics curriculum is an excellent option for homeschooling families. Horizons Phonics and Reading is one of the most rigorous phonics programs for children in kindergarten, first grade, and second grade. It consists of workbooks, storybooks, and a teacher’s manual. What are the Advantages of Horizons Phonics and Reading? The program utilizes colorful workbooks written in child-appropriate language. The program involves reading storybooks after students have advanced through several levels. The storybooks act as incentives to children and teach them the rewards of reading. The program is conveniently split up into two lessons per day, each taking about 15-20 minutes. Children who enjoy the program often advance to higher reading levels. The program includes courses in spelling and vocabulary, so students can get a head start on these subjects. Horizons is so well-structured that most parents do not have to provide supplementary lessons. Horizons includes many review sessions that help students commit their lessons to memory. Horizons uses the spiral method that continually reinforces previous material. While many parents are satisfied with Horizons, some parents feel that this homeschool reading program is unrealistic for their children. Horizons also teaches handwriting skills. Many parents feel this is too advanced for young children. 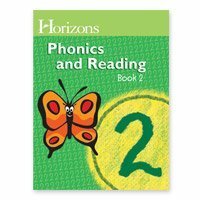 Besides the phonics workbook, Horizons also includes a spelling and vocabulary book and two reading books. Again, many parents feel this is too much work for young children. Young children who are easily distracted may not enjoy Horizons, especially the workbook sessions that require 15-20 minutes of seated work. Christian parents find very few references to Christian teachings and Scripture in the program which usually are the highlights of alpha Omega’s other programs. Is Horizons Phonics and Reading Right for You? If you feel your child is naturally skilled with language arts, then Horizons will definitely be challenging enough for him. Yet, if you have a child who is not inclined to reading it may be better to start out with a more basic reading course, such as Hooked on Phonics and try Horizons after he or she has a basic reading level established. Have You Used This Reading Program?